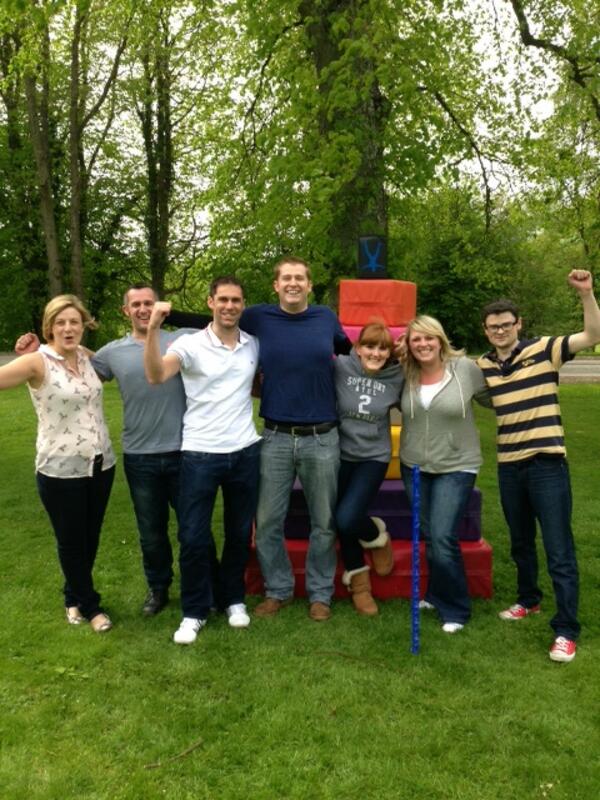 The weather was incredible as we welcomed the team from GE Oil and Gas to the ground of Mercure Ardoe House Hotel for a Team Building event of the Crystal Challenge following their morning conference session. Welcomed by the Leopard Lover himself, the guests were raring to go as we split them into six teams and headed off to compete in the first of six challenges including skill, mental and physical challenges. Some of the teams played it safe with team names (Work4GE) while others really went for it (Your mother can't wrestle but you should see her box!) They were quickly abbreviated to Team 3 haha! The first activity was Towers of Hanoii which proved to be one of the toughest challenges of the day and in the end only one team were fast enough to take home the crystal and that was Team 3, largely thanks to the directions of Neil! Lauren and her team were so disappointed not to complete the challenge making them even more competitive for their next! Ring your Bell was a skill that proved to be a hit or miss with some teams even managing to secure record timings and a lovely bonus crystal! The popular activity of Interlocker was another tricky one that kept the teams on their toes with only two teams managing to secure this crystal. 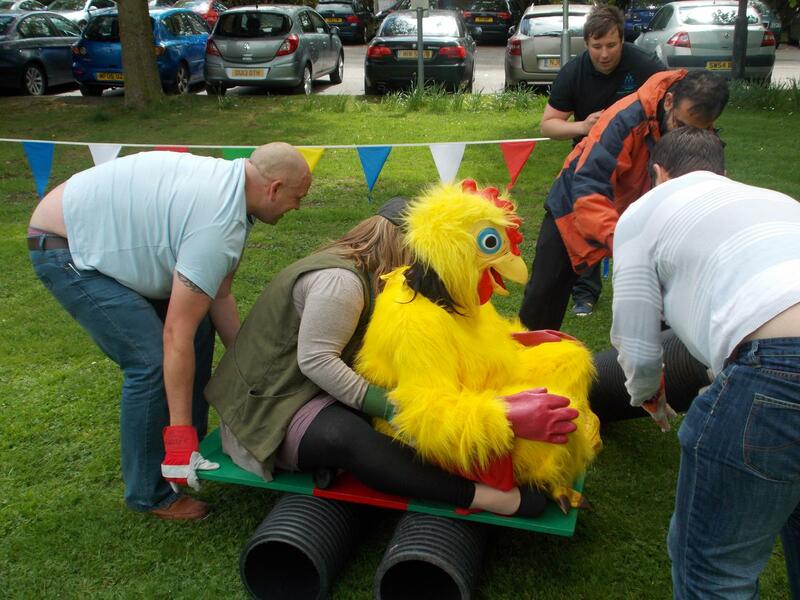 The very entertaining Crystal Challenge game Chicken Fox and Grain was one for Tracey and the team to shine while Gillian had to take a supervisory role after breaking her nail in the most painful manner possible! She kept going through - what a trooper! The individual challenges kept everyone on their toes and provided an opportunity to showcase the various skills of the teams! Flag race was almost a guaranteed crystal as every team managed to beat the (measly!) time of 23 seconds set by our Leopard Lover at the beginning of the event. From one extreme to the other the riddles proved to be almost beyond any hope of success and needed a lot of encouragement from the rest of the teams! As the end of the afternoon drew closer it was time to make our way inside for the Challenge Dome finale where the top three teams battled it out for the trophy! Lyndsey represented Top of the Tree while Neil stepped up for Team 3 and Lolo had a go for Fantastic 5 After some excellent money grabbing attempts the scores were counted and we had our winners. In 6th place with a total of 7 crystals was Too Easy taking home the wooden spoon, while Endeavor and Work4GE took home memories with 8 and 9 crystals respectively. Fantastic 5 came in at third with a respectable 580 pounds from the dome while Top of the Tree were runners up with 660. That meant that the deserving winners of the cup were Your Mother cant wrestle but you should see her box with a whopping 12 crystals and 1240 from the dome. Well done to all the teams for your incredible participation and a special thanks to Gillian for putting the day together for us to enjoy. We look forward to the rematch. "Why are riddles sooooo tricky?! I think we all needed a little help from friends to answer those tricky ones. What a great bunch of people you all are. It was an absolute pleasure to spend the afternoon with you and to witness Neil's exceptional money grabbing skills hee hee. Look forward to working with Gillian again in coming up with the next adventure and see you all soon! SJ"